In late 2014, at a breakfast hosting the British Prime Minister, Australia’s then Prime Minister Tony Abbott described Australia as it existed before white men arrived as “nothing but bush.” In doing so, Abbott perpetuated an ideology very typical to colonial countries: if one suggests that Australia was “nothing but bush” before the white man arrived with his culture and civilization, colonialism becomes a benevolent and victimless act of expansion and discovery. That colonialism is actually the sanctification of centuries of theft, genocide, and ongoing marginalization is obscured. The romantic myth of colonialism—of exploring “new” and “undiscovered” lands—finds itself echoed in the pleasures of open-world video games. While other video games might progress through a series of levels seen once by the player before they pass on through to the next, an open-world video game provides one large, consistent space within which all the game’s action takes place. A typical open-world video game provides the player with various opportunities to explore, each of which centers primarily around a growing familiarity with the consistent space of the game. Story missions can be commenced and completed; various hidden objects and power-ups can be found; side missions and quests can be completed for bonus rewards that make completing the story missions a little easier. Perhaps the most intoxicating moments of engagement with an open-world video game are those first few disorientating and dizzying minutes when the game begins, when everything and everywhere is new, and every single step is another discovery. After fifty hours, this exotic space will have been reduced by memory and experience to one of necessity and efficiency. I will know where to find the airport and the quickest path back to my base. My movements across the space will be funneled time and again down the same freeways or through the same valleys. But at the beginning, be it in Minecraft, Skyrim, Just Cause 2, or Grand Theft Auto III, everything is waiting to be discovered. In an age of Google Maps and GPS, being able to explore and come to know an entirely unexplored land scratches a very contemporary but nostalgic itch for a past time which, to be sure, was nowhere near as romantic in reality. To parallel this sense of discovery, a common trope of open-world video games is for the playable character to be as new to the world as the player. In Grand Theft Auto IV, the player takes control of Niko Bellic as he steps off the boat into unfamiliar Liberty City. In Just Cause 2, the player meets an operative for the CIA Rico Rodriguez as he first enters the airspace of the fictional dictatorship of Panau. In Far Cry 2, the foreign playable character has just gotten off the plane in the fictional African country. The progression of an open-world video game typically sees both player and playable character come to know a foreign land over time, taming it and dominating it. An inherently colonialist way of perceiving space thus emerges as epistemological to many open-world video games. The colonialist politics that still lead people to make the kinds of incorrect and racist statements such as Abbott’s “nothing but bush” sees itself perpetuated: a Western male (the typical star of most blockbuster video games, which are produced predominantly by Western males) enters a foreign (typically non-white) country, and tames it. They map it: they cross meadows to raid it of its flowers and hunt its wildlife; they convince the locals to fight for the foreigner’s cause. The colonized is reduced to resource and commodity for the Western subject (that is, the player). Far Cry 3 is perhaps one of the more explicit examples of this, as Rowan Kaiser focused on in his review of that game. A white boy is rescued by a magical black man to become the natives’ savior. The player kills local people and wildlife in vast quantities to effectively commodify this new land. The player crafts better items out of the hides of the local animals and charts the geography by taking control of radio towers and enemy bases. Over the course of the game, its world is transformed for the player from one of unknown foreign danger to one of safety and resource gathering. To play Far Cry 3 is to act out the project of colonialism in miniature. The perpetuation of such politics of course occurs in all the cultural forms of colonialist societies. The Indiana Jones films have strong colonialist undertones, with their moral certainty that all cultural artifacts “belong in a museum” on the other side of the world, as well as its racial caricatures of “native tribes.” In his recent television series Escape to the Wild, Kevin McCloud interviews British families living in “remote” locations, and he regularly deploys the rhetoric of just how far away from civilization these white people are living—where “civilization” is clearly London and not the local village down the road. Colonialist values are inherent to colonial societies, and thus to their cultural production. In video games, it is just reproduced in a particularly vivid manner where the player performs the colonialism. These ideas are probably best demonstrated in the one open-world game that directly confronts its own colonial politics: Far Cry 2. Where most of these games (including Far Cry 2’s own successors) are typically jovial in tone, reducing the video game space from “place” to “playground,” Far Cry 2 is a more somber experience. Its world is hostile, oppressive, random, and unpredictable. 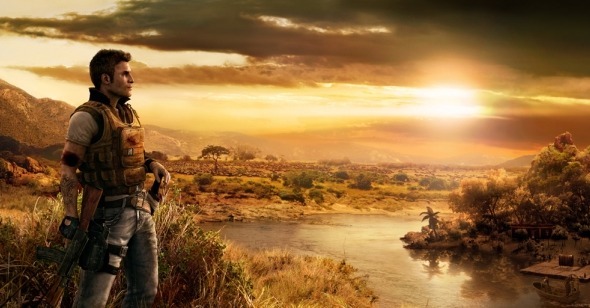 Released in 2008, Far Cry 2 perpetuates and depends on colonial themes and values as much as any open-world game, with the key caveat that it works a critique (or, at least, a cynicism) of the colonialist project into its playing. Heavily influenced by Joseph Conrad’s Heart of Darkness, Far Cry 2 places the player in the role of a foreign, self-serving mercenary playing the two factions of an incoherent African civil war against each other for personal gain while at the same time hunting down a foreign arms smuggler known as the Jackal. Much like Marlow’s obsession with Mr. Kurtz, the hunt for the Jackal is more one of curiosity and admiration for Far Cry 2’s player and protagonist than it is reflective of any straightforward need to kill the bad guy. The game treats its conflicts and characters with cynicism and nihilism. The opposing sides, the UFLL and the APR, are indistinguishable in both goals and attire. The leaders of each are corrupt and interested only in self-serving goals. The numerous foreigners in the country are all exploiting the conflict for personal needs. In a rare case for a first-person shooter, your weapons are untrustworthy, threatening to jam at the exact moment you need them to work. Even the local priest won’t offer free help, only giving you malaria medicine if you transport some fake identity documents to refugees escaping the conflict. Everything and everyone is broken. Where most open worlds become safer over time, Far Cry 2’s is one of constant risk and danger. Your equipment only moderately improves; fire from your own Molotov cocktails could at any moment’s notice surround you; a battle that seems to be going in your direction can be lost because an enemy jeep chose that exact moment to drive down the road behind you. The environment becomes the enemy in Far Cry 2, just as it does in most open-world video games, and it’s an enemy that can never truly be subdued. These dangers are seen most clearly in the game’s enemy checkpoints scattered across the roads. Each jeep trip between locations is routinely interrupted by roadblocks and enemies. Because conflict in Far Cry 2 is so challenging, each of these roadblocks provides a major setback and makes even the simplest trip a potentially fatal challenge. Worse still, while in later games in the series a checkpoint would remain depopulated after the player kills its guards, in Far Cry 2 if the player just wanders some way down the road then turns around, all the killed enemies are back again. The game received criticism for how quickly these checkpoints are repopulated, along with other systems that felt unfair or unpredictable (such as the deteriorating weapons and random malaria). It was frustrating and certainly unfair, but each of these elements thematically resounded with the game’s broader cynicism. Unlike Far Cry 3’s world, which became safe and friendly (and uninteresting) after enough checkpoints were destroyed, the one in Far Cry 2 stubbornly resists the player’s colonial attempts. The game will let you eke out a living, but it will never let you take over its entire world. Just like the broader conflict into which the player has stepped in this fictional country, the player’s attempts at colonialization are pointless, dashed at every turn. Which is not to say Far Cry 2 is an anticolonial or even a postcolonial game. It is still about a foreign agent intervening in a stereotypical African conflict with self-serving goals. But it draws attention to the colonial politics of its own genre in an evocative and challenging (and not always “fun”) manner that reinforces the game’s general nihilism. It points to the stubborn and imperfect ways in which colonial countries never fully tame the lands they claim as their own. It suggests that the benevolent white men and their colonial projects are self-serving in their pillage of indigenous lands and, further, that colonialism is a project that is never completed but continues to persist—as much for the ever spawning checkpoints in Far Cry 2 as for the indigenous cultures of Australia who have 40,000 years of their own history obscured when the Prime Minister claims the island was “nothing but bush” a few short centuries ago.